According to the Isle of Jura’s website, the prophecy for which Prophecy is named was levelled at the Campbell family by an old woman who had been rudely evicted from her home by the aforementioned ruling clan. This woman was apparently a “seer”, and while it’s not entirely clear why she was evicted, too many loud parties was probably not the reason…seers typically don’t go in for that kind of thing. My guess is the eviction was done for financial reasons, seers being notoriously poor bill-payers. In any case, I’m sure the Campbells had their reasons, they’d just recently taken control of Jura and probably had big plans of their own, but to be honest, evicting an old woman, especially a seer, always seems a bit heartless. The old woman evidently thought so too, and so put out was she, that she prophesied that the last Campbell to leave the island would do so with only one eye in his head and all his stuff in cart pulled by a white horse. I think the old woman was being pretty kind. Given the circ’s, I would’ve been a bit more vindictive, especially with the horse part…a white horse, c’mon, that’s classy, she should’ve made the guy carry all his own crap off the island. It turns out that many years later, in 1938 to be exact, the last Campbell, Charles, blinded in one eye during World War I, found himself struggling to make ends meet and had to leave his family’s estate and the island. He did so by bundling all his stuff up and making his way to the ferry pier…in a cart…pulled by a white horse. The moral of the story here is clear: do not evict aged females with extra-sensory prowess no matter how far behind they are on rent. Named for this bit of Jura Island lore, Prophecy was first released in 2009. They call it a “profoundly peated” whisky, and while it doesn’t compare to the more heavily peated Islay malts in that department, its peaty profundity does live up to a couple of definitions of the word. Like Superstition, this one seems to be made up of younger peated whiskies and older non-peated ones with all being married at the end in sherry casks. Unlike Superstition and unlike most whiskies in the Whyte & Mackay family, this one has not been chill-filtered. 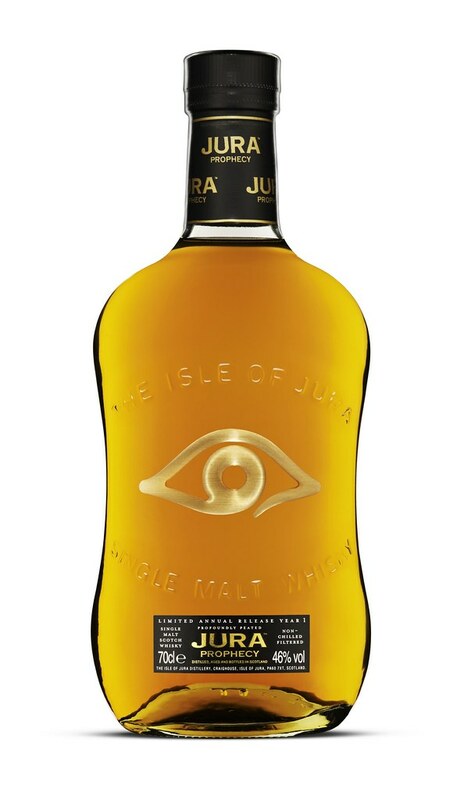 The Dalmore and Jura always catch a lot of flack for their relatively low ABV, chill-filtering, and caramel-coloring, and while I personally think those things detract from their whiskies, I am no expert, and trust they know best what to do with their product. However, I think the majority of single malt drinkers are increasingly educated and looking for non chill-filtered, natural color, higher strength malts. Prophecy’s higher ABV and un-filtered-ness might hopefully be a sign that Whyte & Mackay are coming around to that way of thinking. The Nose: A nose that smells like it comes from across the Sound of Islay. Heavier peat than the Superstition, still has the lightly tarry, medicinal note, but there’s more smoke here, burning hay and leaves. Though there’s a fair amount of sweetness, the fruit is a bit more pungent and less sweet with notes of chocolate covered fruit, orange pith and apple cider. Chocolaty grain, dried hay, and anise round things out. The Palate: Oily mouthfeel with an initial raisin-y, fudge-y, almost sherried sweetness that quickly gives way to the growing peat and smoke. Sweetly medicinal at first, the greenish wood smoke grows and grows towards the finish. Clove and cinnamon and a little salt and pepper spice up the smoke towards the end and give it even more punch. The Finish: Medium-longish, mouth-watering, and satisfying with white pepper, peat and smoke. Thoughts: Really excellent, delicious stuff, easily my favorite of all the Juras. While I enjoyed the balanced but very sweet, light, peat of Superstition, Prophecy is simply a better whisky, more nuanced, more complex, more balls. It does a great job mingling the sweet and peat on both the nose and the palate, letting the two disparate flavors compliment each other and work together throughout the dram. A must try for peat-lovers and worth the $65-75 price tag. “i’m sure they had their reasons.” Yes they did. Simply, the Campbells never saw a piece of land they did not want and try to take, usually successfully, the voracious bastards. A really nice one. just reviewed it myself this week. what a coincidence!